It is the responsibility of nursing care facilities to design a plan of care that attends to the individual needs of each patient. The failure to properly monitor the blood glucose levels of diabetic patients can have catastrophic consequences that may result in severe injury, coma or death. If a diabetic patient fails to receive proper monitoring or care, the nursing facility may be held liable for negligence or medical malpractice if the negligent care results in complications and undue pain and suffering. Our Chicago nursing home abuse team is committed to ensuring that nursing home patients receive the care that they deserve by holding facilities accountable for their misdeeds-- including complications related to a facilities failure to monitor and attend to the needs of a diabetic patient. Diabetes is the inability of the body to process sugar in an efficient manner, resulting in hyperglycemia— or high blood glucose levels. Insulin is required for the use of glucose by the body’s cells and diabetics are unable to produce sufficient levels of insulin or have become resistant to the insulin that is being produced. This results in elevated blood glucose levels; which are the cause of many conditions and complications such as nerve damage, heart disease, mood changes, dizziness and loss of cognitive function. Medications that treat diabetes work by lowering the body’s resistance to insulin or helping the body produce the insulin that it needs. Patients who are unable to produce any insulin at all may need to take insulin injections or use an insulin pump that maintains steady levels of insulin in the blood. On occasion, these medications may lower a diabetic’s blood glucose levels too much, resulting in hypoglycemia— or low blood sugar. Having low blood sugar can result in severe medical complications as well which include coma or death. In order to maintain a healthy blood glucose level, diabetics must be monitored on a regular basis to ensure that their blood glucose levels are balanced properly. 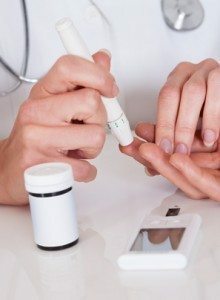 Blood glucose testing is a simple procedure that requires a single drop of blood and a test meter that is simple to use. There is absolutely no excuse for the failure of nursing care staff to properly monitor a patient’s blood sugar levels. The consequences of unregulated blood sugar, however, can be catastrophic. The symptoms and conditions caused by blood sugar irregularities can be as minor as a headache and lightheadedness or as severe as advanced nerve, kidney, liver or heart damage. The following symptoms and conditions may result from unmonitored glucose levels. Sudden change in mood or irritability. Damage to the liver, kidneys or heart. Ulcers in the extremities— most commonly the feet. If your loved one suffered an injury because of the failure of nursing care staff to properly monitor his or her blood glucose levels, you may be entitled to compensation. Contact Rosenfeld Injury Lawyers LLC today to schedule a risk free consultation with an experienced Chicago, IL nursing home abuse attorney to learn more about your rights and to evaluate the details of your diabetes complication case involving nursing home. If we are unable to assist you or earn compensation on your behalf, our services and advice will be free of charge.